Born 1975 in Poland, Adam Twardoch lives in Berlin, where he works as typographic consultant to worldwide clients. He specializes in multilingual typography and font technology, with special focus on Latin diacritics, the Cyrillic alphabet, Unicode, OpenType and web fonts. Since 2000, Adam has been serving as glyph wrangler at MyFonts, handling multilingual font issues, developing in-house software tools and consulting on typographic and technical questions. Since 2004, Adam also manages product development at Fontlab Ltd., a multinational software company specializing in type design and font creation software. Adam also works as font technology consultant for a number of clients including Monotype, Adobe Systems, Corel Corporation, Tiro Typeworks, WinSoft, and others. Adam develops OpenType fonts, creates multilingual versions of typefaces, and occasionally designs print publications and websites. He regularly writes and lectures about fonts, typography and web design in English, German and Polish. Adam studied business administration and cultural studies at European University Viadrina in Frankfurt (Oder), Germany. 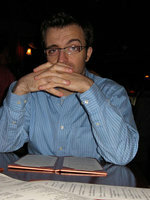 He is a Board member at ATypI (Association Typographique Internationale). In this native Poland, he is also member of the Polish TeX Users’ Group GUST. In 2005, he co-founded the AKT typography course at the UKSW University in Warsaw, where he remains visiting lecturer. He has co-edited d2d.pl’s Polish-language editions of several typography books: The Elements of Typographic Style (Robert Bringhurst, 2007), Detail in typography (Jost Hochuli, 2009), Cómo crear tipografías (Henestrosa, Meseguer, Scaglione, 2013). Adam likes learning languages, enjoys meaty BBC comedies such as Fawlty Towers and The Thick of It, and cultivates his on-going fascination with Shakespeare.